In order to construct information systems, which are rapidly gaining on the human level of reasoning, the faculty for this discipline has been assembled from various academic areas to engage in a wide range of research on computer science. The diverse strengths of faculty and students in science and engineering are expected to form a comprehensive vision of interdisciplinary research. This program was established in April 1992, and has welcomed a broad range of students from such areas as mathematics, electronics and computer science, transportation engineering and socio-technology, and oceanic architecture and engineering, issuing its first Master’s degrees to 23 persons in April 1994. 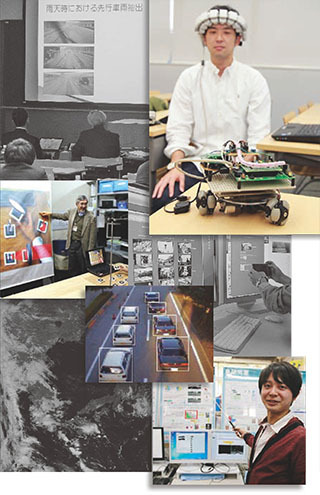 Lectures are presented on fundamental subjects such as advanced pattern recognition, knowledge engineering, information theory, automata, and also on a wide range of specialized subjects such as on computer graphics, traffic information engineering, computational mechanics, medical electronics, bio-information science, advanced man-machine interface, advanced information processing and memory devices. This allows a varying array of views on hardware- and software-related matters to be studied.